The average global company, one with about $11.2 billion in annual revenue, will spend from $13 to $22 million this year marketing through mobile devices, according to Business Standard 72% of consumers want mobile-friendly sites. While your law firm’s revenue may not be in the billions (or even in the millions) you should be thinking about how mobile devices can help your business. Learn more about mobile and start using it to promote your law firm. Your website should work on a mobile device. There are different ways to build a mobile-friendly site, though. One way is to create a separate site just for mobile users, where everything is unique. Mobile users read less, for example, and may have a slower connection. A uniquely mobile site could include shorter text, clickable phone numbers, fewer graphics and different navigation. But how far you go to optimize phentermine your law firm’s site for mobile will probably depend on your budget. Unfortunately, most small and medium-sized law firms don’t have the budget or the resources to build and maintain a separate site just for mobile devices. It can be expensive to create a site just for mobile users and time-consuming to maintain. 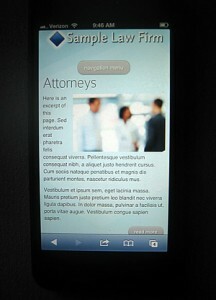 Most of our web design templates for law firms will automatically detect when a visitor is using a mobile device. Mobile users see a site with special, easy-to-use navigation and images optimized for mobile. If your law firm is looking for a mobile website, contact us for a quote. Fortunately, there is a solution that works for most law firms. You can create a mobile website that uses content from your current site, but presents it in a format that works for mobile devices. While this may not be optimal (because mobile users have different needs), you’ll still have a mobile-friendly website that helps your firm engage clients and prospects. Finally, another way to reach mobile users is with a mobile “mini-site” that takes the best from your website, condenses and optimizes it, and serves it to mobile users. That way, you still have a mobile presence, but it costs less to create and is easier to maintain. One key to showing up on mobile devices is to be sure your law firm is listed in local directories like Google Places for Business and Bing Local. If you’re running online advertising campaigns, you should create separate campaigns for mobile devices and drive mobile users to mobile-optimized landing pages. While a video and a form may work on a PC, they won’t work well on an iPhone. Instead, you can create a landing page that works well on a small screen. Need help? Contact Law Firm Web Design. We can build a landing page for you that’s optimized for mobile searchers – it will load quickly, won’t include things that don’t work on mobile devices and will help compel visitors to take action. Ready to take your law firm website to the next level? Contact us to get a no-obligation law firm website design quote.